Sir Malcolm Campbell, Howard Hughes, Keith Moon, Yves Saint Laurent, Muhammad Ali and our own Charles Rolls to name a few. Young gentlemen in a hurry, driven by their restless spirits to change the world in their own way. Untrammelled by social convention, these disruptors lived life on the edge, believing the ultimate power to be self-empowerment, pushing every boundary to realise their personal vision. Glamorous and daring, they lived fast, worked hard and played hard. Today’s generation of young, self-empowered, self-confident rule-breakers are just as uncompromising and unapologetic in their choice of living and lifestyle as their predecessors. They follow the road less travelled, live the unconventional life, darkly obsessed by their own pursuits and accomplishments from which they derive a pure adrenaline rush. Their life is their entertainment, and they live it on their own terms. And when the day is done, and the battle is won, these supremely confident people engage with the night, they go where it leads, and take all it has to offer as their just reward. As demanding in their lifestyle as they are in their life pursuits, these highly-driven people insist on great substance from any symbol of their lifestyle. More and more, such individuals wish to demonstrate their success through a symbiosis between their life’s work and their chosen brands. Over the last years, many such individuals have gravitated towards the revitalised Rolls-Royce Motor Cars as the brand most appropriate to encapsulate their truly individual lifestyles, much as their celebrated predecessors did in days past. 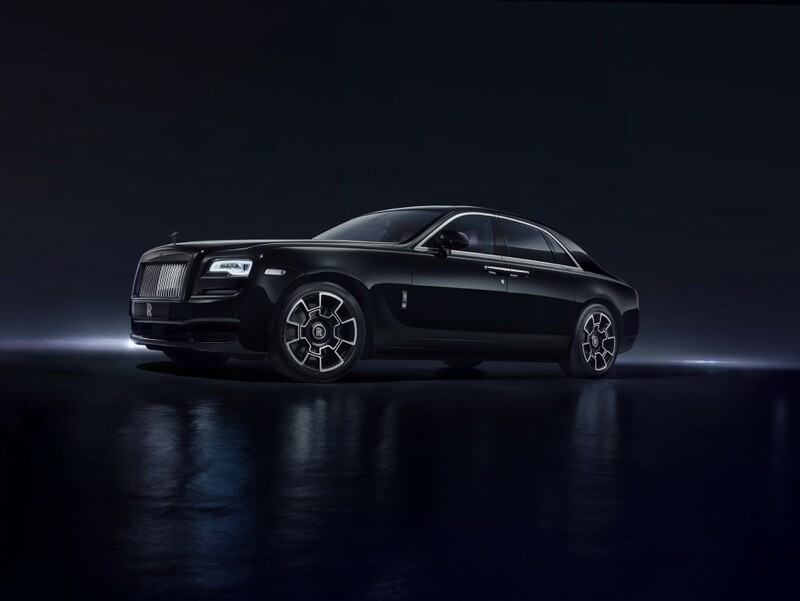 And, always ready to deliver a truly Bespoke answer to meet the customer’s desire, Rolls-Royce Motor Cars has once again demonstrated its true luxury credentials as the world’s leading super-luxury brand. Rolls-Royce has transformed the very icons of its brand to access a darker side of its character more suited to this breed of successful people. The result is Black Badge. 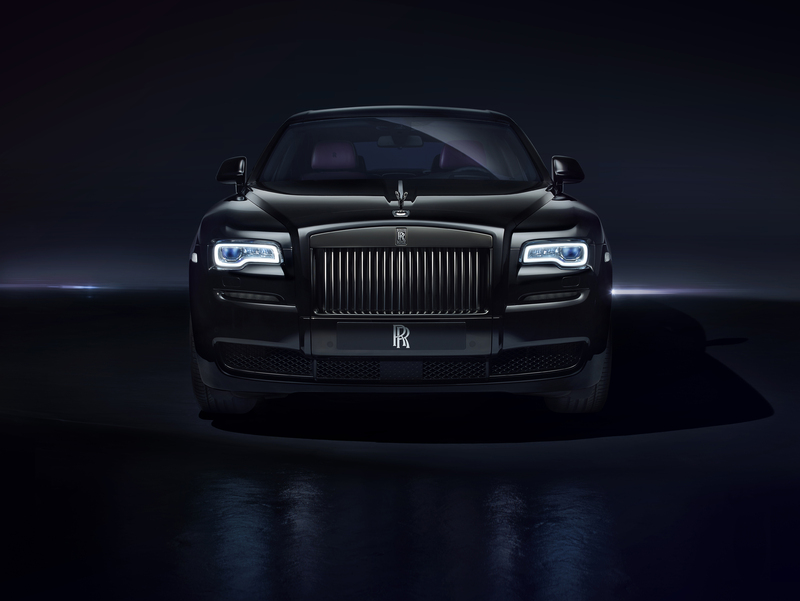 Rolls-Royce Black Badge speaks to the darker, more assertive, confident and demanding aesthetic of these customers. As a truly Bespoke response to their desires, the interplay of brand and customer has had a transformative effect on the appearance and substance of Rolls-Royce Ghost and Wraith. The result is Ghost Black Badge and Wraith Black Badge. With this manifesto as their departure point, Rolls-Royce designers, engineers and craftspeople set to work transforming Ghost and Wraith in subtly different ways. Their intent was to deliver darker, more assertive and more focused Black Badge alter egos that differ from each other as much as they do from their siblings. The result? Two cars that at first glance offer very distinctive, common visual cues to their nature. But below the surface these are two very different beasts of the night. Together with the Parthenon Grille, the famous Double R logo and the Spirit of Ecstasy are the very embodiment of the Rolls-Royce brand. However, these treasured symbols of the marque have been willing to change their identity in appropriate circumstances before. 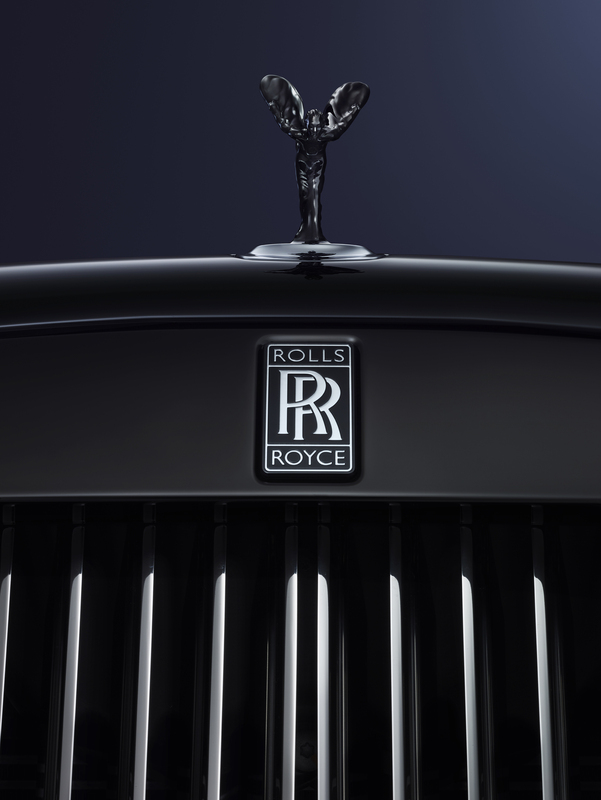 For example, in 1933, in a move that signalled the truly Bespoke nature of the company from an early stage, Sir Henry Royce himself changed the Double R badge from the traditional Red-on-Silver to Black-on-Silver to ensure it would not clash with the paintwork colour choice of high-profile customers including the then Prince of Wales. The iconic Spirit of Ecstasy figurine has, over the years, also gone through a number of iterations both in design and materials used. She has been large and standing, kneeling and inclined forward to indicate higher performance; she has been made of gold, silver, crystal and stainless steel, and has been bejewelled, lit and uplit. Now the Spirit of Ecstasy and the iconic Double R lead the way once more as Rolls-Royce enters the alternative reality of ‘Black Badge’. On the surface of it, both Ghost Black Badge and Wraith Black Badge go through a very similar transformation. The transformation begins with the ‘Flying Lady’ who changes neither in design, posture nor material, but in colour to represent the owner’s dark obsession. She mutates into a high-gloss black vamp, proudly scything through the night-time cityscape. The transformation pervades the other iconic symbols of the Ghost Black Badge and Wraith Black Badge. The Double R badge on the prow, flanks and aft of every Black Badge motor car invert to become silver on black, whilst chrome surfaces such as the front grille surround, boot lid finisher, lower air inlet finisher and exhaust pipes, turn dark. The power of Black Badge communicates itself into the ground through new composite carbon fibre and lightweight alloy wheels unique to each Ghost Black Badge and Wraith Black Badge commissioned. Developed by Rolls-Royce over four years, the new wheels feature 22 layers of carbon fibre laid in three axes, and folded back on themselves at the outer edges of the wheel rim to provide 44 layers of strength. Further strength is added via the 3D forged, aircraft-grade, aluminium hub which is bonded to the rim using aerospace strength titanium fasteners. Black Badge will bring the colour black to new levels of intensity. The multiple layers of paint and lacquer that go into creating Black Badge Black are repeatedly hand polished – the most exacting painting and polishing process ever used for a solid paint colour. The result is the deepest, darkest and most intense black ever seen on a production car surface. 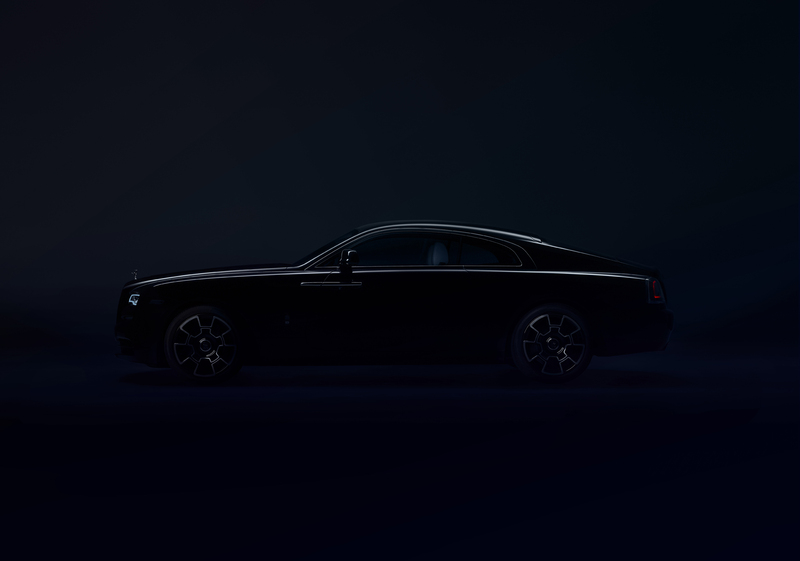 However, as Bespoke is Rolls-Royce, clients will of course be able to specify whatever colour they wish for the exterior colour and interior leather colour of their Ghost Black Badge or Wraith Black Badge. Possibilities become limitless inside the Black Badge cabin as it is suffused with a darker re-interpretation of pure luxury, inspired by Rolls-Royce’s advanced materials and aerospace heritage. The centrepiece of the Black Badge cabin is the aerospace-grade aluminium-threaded carbon fibre composite surfacing – material often seen on the surfaces of stealth aircraft. This futuristic material has been reinterpreted at Goodwood to become the world’s most innovative new super-luxury material. To create this beautiful and innovative material, threads of aircraft grade aluminium just 0.014mm in diameter are painstakingly woven together before being bonded with carbon fibre. This surface material then has six coats of lacquer applied, is left to cure for 72 hours, after which it is hand-polished to a mirror finish. In addition to the creation of this luxury material, the air vents on the dash and in the rear of Black Badge motor cars have been darkened through the use of Physical Vapour Deposition. This surfacing method is one of the few ways to colour metal whilst ensuring that the parts will neither discolour nor tarnish over time or through repeated use. Set into the cars’ fascia is a newly created Black Badge clock whose hands are tipped in orange and whose face is adorned by the ‘Unlimited’ rating infinity logo that previously appeared in the celebrated Phantom Drophead ‘Waterspeed’, created in 2014 to celebrate the daring of world speed record champion Sir Malcolm Campbell. In common with Campbell, the Black Badge owner’s attitude to apparent limits is to challenge or ignore them, a trait celebrated by the ‘Unlimited’ logo. The ‘Unlimited’ infinity logo is also embroidered on the Black Badge’s upholstery as black leather combines with vibrant colours of Tailored Purple in Ghost Black Badge and Cobalto Blue in Wraith Black Badge, delivering a more edgy feel to the cabin. The final touch? The moody light cast from the black starlight headliner, and reflected around the cabin from the polished fascia, to create a darkly atmospheric ambiance. Each of the motor cars that host the Black Badge spirit are very different Rolls-Royces – unlike any Rolls-Royce before. Launched in 2009 and refreshed in 2014, Ghost is no ordinary power – the most contemporary interpretation of a Rolls-Royce ‘limousine’ which attracts those wealth-creating entrepreneurs who like to drive as much as be driven. Introduced in 2013, Wraith is the ultimate gentleman’s Gran Turismo, a true driver’s car. How to imbue these two fantastic motor cars with the spirit of Black Badge in an authentic manner without diminishing their original essence? In Ghost Black Badge it is important to ensure rear compartment passengers’ comfort by maintaining Rolls-Royce’s renowned ‘Magic Carpet Ride’. Rolls-Royce engineers used the flexibility of the 6.6 litre V12 engine to make Ghost Black Badge a little more menacing. Subtle engine output modifications see power increase by 40hp (30kw) to 603hp (450kw) and torque by 60Nm (840Nm) compared to current Ghost, whilst upgrades to the 8-speed automatic transmission give Ghost Black Badge an added sense of urgency in how it delivers its power. Intuitive Throttle Response, delivered by computerised smart electronics, carefully hones the response of the transmission. Beyond 25% throttle, the transmission transforms its character, holding gears for longer and shifting between 200rpm and 500rpm later, dependant on gear. Additionally, initiating a downshift requires 20% less heft on the throttle, making Ghost Black Badge react more quickly to driver inputs. Under braking conditions the transmission downshifts a few rpm sooner, providing the extra security of added engine braking thereby delivering a more spirited drive. Suspension and steering changes, including the addition of new drive shafts, have ensured that Ghost Black Badge continues to deliver the most luxurious ride, with just that little bit of extra driver focus. Wraith Black Badge was a completely different proposition. Already the most powerful Rolls-Royce in the world at 623hp (465kw), Wraith has always been the most driver-focused car in Rolls-Royce’s model range. However, understanding how driven this new breed of customer is and their wish to push the boundaries of life, Rolls-Royce’s engineering team worked painstakingly to give this most phenomenal fastback coupé a uniquely discernible extra edge. By combining an extra wave of torque (+70Nm) with the already existing high power output, a completely redesigned air-suspension set up, new drive shafts and uprated 8-speed transmission, Rolls-Royce has produced an even more driver-focused, agile Wraith, while at the same time preserving the intrinsic elements of the effortless Rolls-Royce Magic Carpet Ride. Again, upgrades to the 8-speed automatic transmission injects a level of added urgency in how Wraith Black Badge delivers its power. Intuitive Throttle Response also comes to Black Badge Wraith. From 25% throttle, the transmission holds gears for longer, shifting gear between 300rpm and 500rpm higher in the rev range, dependent on gear. Wraith Black Badge also revs all the way to 6,000rpm before each gear change when the throttle senses that it is at 80-100% open. This gives a more direct throttle response feeling during spirited driving with peak power available more of the time. In addition, with the Intuitive Throttle in its mid-range (c. 70% to 80%), the gearbox is instructed to adopt a faster shift pattern. During deceleration or braking, the transmission downshifts a few rpm sooner, providing the extra security of added engine braking thereby delivering a more spirited drive. The result is a tauter and slightly more physical driving-focus with significantly increased handling capability, a high degree of steering feedback and more neutral cornering characteristics. With its speed dependent steering adjustment, the car delivers a greater sense of security, even at high speeds as the weight of the steering adjusts to the speed of the car. Always conscious of the safety of its owners and other users of the road, Rolls-Royce has also upgraded the brakes of both Black Badge models, increasing the diameter of the front brake discs by one inch for a swifter and more direct brake pedal response. As a final safety enhancement, Wraith Black Badge has been equipped with automatic LED headlights ensuring optimum night vision while scything through the dark.